Happy Spring! I mean, happy "Calendar Spring" but still winter! We had 2 inches of snow, but don't worry, it was 72 the next day. If, in fact you were missing the snow it is OK, it snowed again 2 days later and we followed that up with some thunderstorms. I mean, SERIOUSLY? Mother Nature is like a mom, laying on the bed, grunting and groaning, twisting and shaking trying to get a pair of skinny jeans on from last year. Ain't happening girl. I just want Spring. I just want thunderstorms, and sun, and flowers popping out of the ground and to put my patio together. Is that SO much to ask when in fact, it is supposed to be Spring? I hope you all had a blessed Easter! I cooked a feast, as usual, I needed about 10 more people to eat according the amount of food I made. I just have this issue, I would rather way over cook and have days of leftovers, than to have someone walk away from my table still hungry. No, it isn't going to happen. However this year, I decided to stick with one dessert. "Banana something" was requested. I wanted easy, because as it happened, I was up hurling my guts out the entire night before Easter. To much information? Sorry. I had no energy so, thankfully we were eating late and I could cook and rest and cook and rest. Mom power is amazing. This was an easy recipe I came up with, to satisfy the "banana something" request and still make it a little special for Easter! I hope you love it! Prepare your yellow cake mix as directed. In another bowl, mash bananas and baking soda together. Add into the cake mix and add your extract. Mix to completely combine. Spray a 9x13 cake pan with nonstick cooking spray. DO NOT PREHEAT YOUR OVEN! Place cake in the oven and then turn oven on to 350 degrees F. Bake at 350 F, for approximately 1 hour. Let cake cool completely before moving on to the next step. 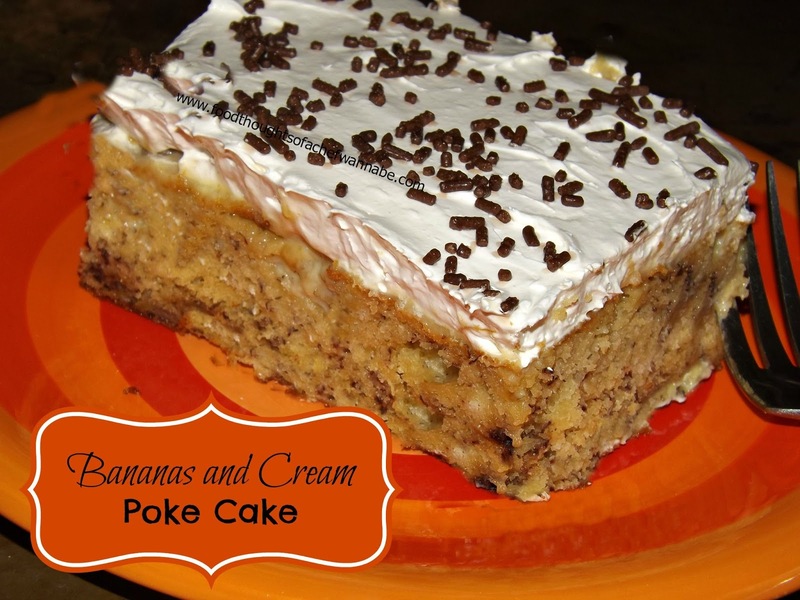 Poke holes in your cake. I used the hand of a wooden spoon to make large holes for the thicker pudding! Prepare according to package directions and pour over entire cake, covering the entire top! It will likely settle on top a bit, but that is a good thing! Refrigerate for 1 hour! Chocolate Jimmies or Nuts of your choice for the top! Whip together all ingredients except sprinkles. Whip until fluffy and completely combined. Frost cake and add sprinkles or nuts of your choice! Refrigerate until ready to serve and keep refrigerated after!